I feel like my life these days is such a balancing act (whose isn’t?). It’s all about keeping some sort of equilibrium. Or maybe it’s about seeing just how much I can get away with. For example: I went for a run yesterday. Do I have to do it again today? Exactly how much laundry can pile itself up before I’m out of underwear? Is it still considered “working” if I’ve got World Cup soccer on in the background? What if it’s on mute? Also, I had salad for lunch. Can I have three fudgesicles for dinner? Balance. Between being a good and healthy person and letting my inner lazeball/chubster peek through. My good and healthy side has not just vacuumed but mopped, too, thrives on yogurt and chia seeds, finished planning her wedding months ago, and always remembers to take out the trash. My inner lazeball has watched three movies today and has a fudgesicle stain on her pajama shirt (which, by the way, she is still wearing. It’s noon). 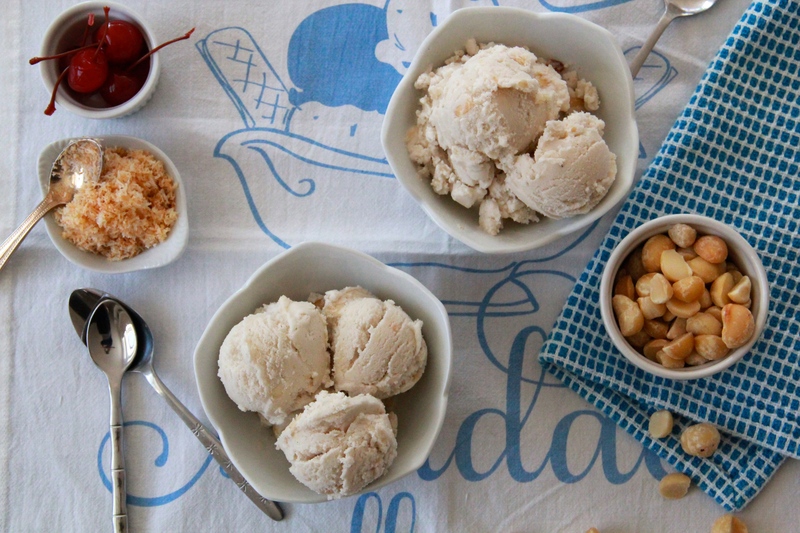 This ice cream recipe is a manifestation of my constant struggle for balance. 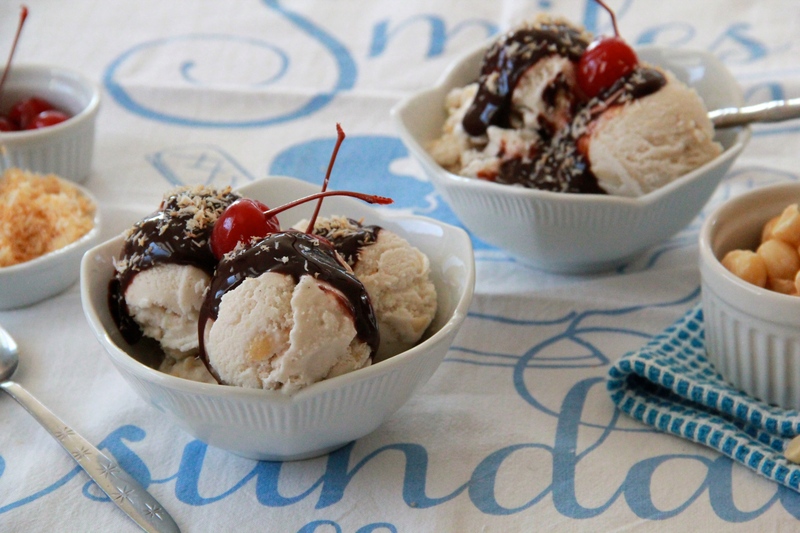 The thought process of making and eating it went something like this: I want ice cream. A big bowl. What if it’s dairy free and vegan? That’s fine, right? Totally fine! Coconuts are healthy. So is a little bit of rum, probably. And I can add some chocolate sauce. Just a little bit. …A little bit more couldn’t hurt. I mean, I went on a run two days ago. And I’ll vacuum afterwards. Probably. This ice cream is smooth and creamy straight from the churner, though it ices up a bit once you store it in the freezer overnight. It’s all good though, because the flavor is amazing. It’s rich and light at the same time. The dark rum here is optional, but amps up the flavor to tropical-drinks-on-a-beach level and helps with the consistency, to boot. If you don’t have whole vanilla beans, substitute a teaspoon or two of pure vanilla extract, and add it with the second can of coconut milk. In a medium saucepan, whisk together 1 can of coconut milk with the brown sugar. Add the vanilla bean and seeds, and place the pan over medium high heat. Warm the milk until the sugar has fully dissolved and it’s starting to bubble at the edges. Remove the pan from the heat and whisk in the second can of coconut milk and the rum. Remove the vanilla bean pod (rinse and reuse it to make vanilla sugar or extract!) 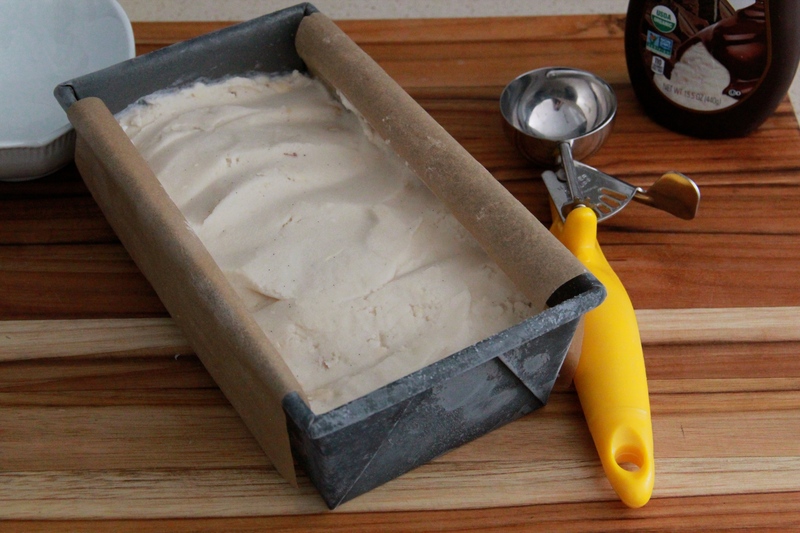 and pour the ice cream base into a large measuring cup. Store it in the fridge to chill, at least 2 hours (and up to overnight). 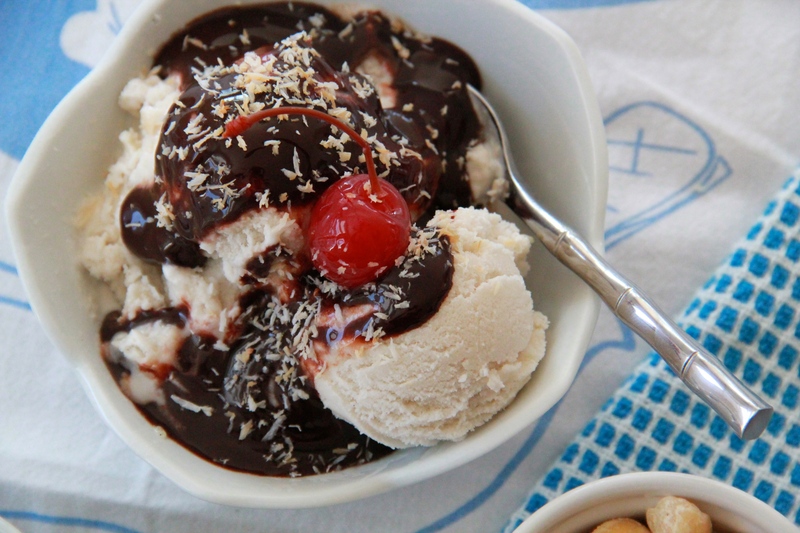 Churn the coconut milk mixture in an ice cream machine according to the machine’s directions, until creamy and thick. 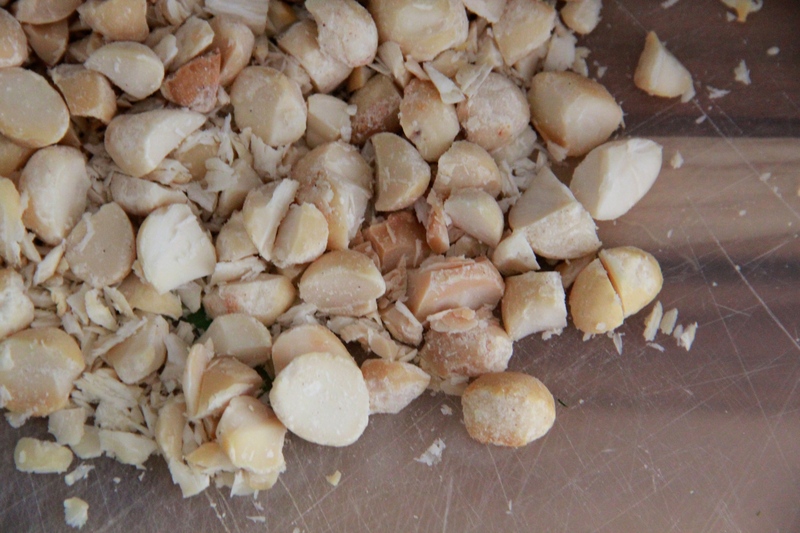 Stir in the macadamia nuts. Serve the ice cream right away, while still the consistency of soft-serve, or let it harden in the freezer for a few hours before scooping and serving with toppings galore. The ice cream will keep in the freezer for about a month. p.s. that blue and white background/tea towel (?) is super cute. looks amazing, chef molly! love and MISS you! thanks I love you jane! Super mad I don’t live near you right now. Looks fabulous!